So you're thinking about downloading the Galaxy S8 Oreo beta, but you're not sure if it's stable enough to use. It is a beta, of course, so you might want to wait for others to give it a try. Over the past ten days I've used the Galaxy S8+ running Android Oreo as my daily driver, running down the best new features. Let's take a look at the bugs, the performance, and the battery life. With any beta release, there are bound to be some bugs. These bugs often take the form of force-closing apps, sluggish animations, or poor camera performance. With the Oreo update for the Galaxy S8, the bugs are fairly minor, but there are plenty of little things you should be aware of before installing Oreo. The biggest culprit for me thus far has been Bixby Home. Whenever I swipe right to open Bixby, the app immediately force closes or gives an error message. A few users on Reddit have complained of third-party app force-closes from Bank of America, Fenix, and Google Maps. On the animation and performance front, I haven't seen many issues, and the camera performance has always been quite good thus far. Another oversight is the seemingly simple ability to disable new app icons from adding to your home screen when you first install them. The newest version of the Play Store — the one compatible with Android Oreo — discards the option to add an icon to the home screen for each newly installed app. With the new Pixel 2 line of devices, Google simply moved this option to the home screen settings in their launcher. Unfortunately, Samsung forgot that the option was no longer included in the Play Store, and did not add this toggle to their own home screen menu. This seems like a small mistake that will be corrected quickly, although it is very annoying for anyone using the beta. (1) New Play Store Settings Menu. Notice the option to add app icons to home screen is missing. (2) Galaxy S8 home screen settings, also missing the app icon toggle. Perhaps the most annoying issue with Android 8.0 on the S8 is the omission of features that were included in Nougat. One of the important examples can be found in the camera app, which received a notable UI refresh in Oreo. The HDR toggle that was previously on the top row in the camera UI has now been buried inside the detailed settings menu for the app. This change is in line with the interface on the Note 8, but it's still a substantial step back in my opinion. Enabling HDR mode manually is a significant benefit, and something I use all the time. Hopefully Samsung will hear the cries of beta testers and backpedal on this UI change. (1) HDR Settings are buried on S8 Oreo update. (2) HDR toggle located on top row of Camera UI on S8 running Nougat. Watching video is something we all do on our phones — in fact, many of us spend a large portion of our screen time consuming media. The Galaxy S8 featured an incredibly useful full screen mode for consuming YouTube content at launch earlier this year. This feature was one of the distinguishing factors when watching Youtube on a Galaxy S8 versus the LG G6 when the two phones were initially compared. Notice the full screen toggle towards the upper-right corner in Nougat. For some strange reason, Samsung decided to remove the full screen view in Oreo on the S8. The option no longer appears as a toggle, or any other place in the settings menu. It's also not possible to pinch-to-zoom like you can on the Pixel 2 XL. Many people have expressed their displeasure with this choice, so it is possible we will see this feature return for the stable release. The toggle is strangely absent in the Oreo beta update. While the above issues are the biggest problems on the beta, there are a few more assorted things I've noticed in my time testing. Android Auto is completely broken, I verified this with my own 2016 Honda Accord with built-in head unit. Many others on Reddit have also noticed this particular issue. Android Auto doesn't have the largest user base, but it is something to be aware of if you depend on it daily for Maps access. The ability to share screenshots in WhatsApp is also broken. Strangely, sending regular pictures works fine, just not screenshots. Finally, I've noticed intermittent audio distortion issues when using wired headphones with Play Music or YouTube. The issue is limited only to wired headphones and these two apps as far as I can tell (Spotify seems to be unaffected). Battery life on the device has been significantly worse than my experience on Nougat. With my regular daily usage, I achieved about 4.5–5 hours screen on time (SoT) using the stable Nougat software on my S8+. While running the Oreo beta the past ten days, I've been around 3.5–4 hours SoT with the same daily use. Of course, battery life is very subjective, so your mileage may vary with this particular aspect of the update. At the end of the day, the S8 Oreo software is still in beta, and that means some hiccups here and there. I would not recommend anyone use this as their daily driver, but if you have a spare phone, it's a lot of fun to test. If you're using the S8 Oreo Beta, let me know about your experience and any other bugs in the comments below. 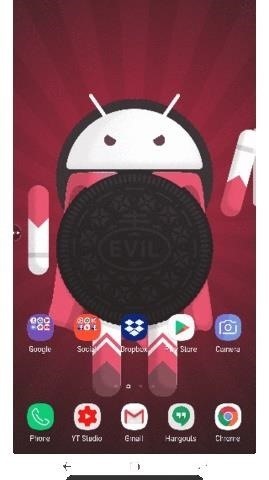 This post will be updated as soon as we receive the Oreo Beta 2 update on our device and check on any changes.